Q: What actor played the murderer Fax Newman? While most of the major characters in the Matthews family would be recast multiple times over the next 18 years, it would be Rachel and Mac Cory who took the show to its greatest fame of the mid 70's. By this time, core supercouple Steve and Alice were separated by his apparent death, and Alice was recast because of apparent backstage squabbles. Mary Matthews met an untimely death, and Rachel's oft-married mother Ada became the show's truth-telling matriarch. As played by Constance Ford, Ada was one of the show's most beloved characters, and until her death in 1992, Ford remained the show's longest running cast member. All you have to do is see her as the evil mama in "A Summer Place" and various other films of the early 60's to see how versatile an actress she was. While Liz Matthews was recast many times, it was Irene Dailey's performance which got this character her most memorable scenes and won Tony Award Winning Dailey an Emmy. Liz was the last of the Matthews on the show, last seen at the show's 30th anniversary in 1994. Another acclaimed performance was Beverlee McKinsey's Iris, who played the spoiled daughter of Rachel's husband, Mac (played by stage vet Douglas Wattson). I never saw McKinsey as Iris, although I did witness her incredible talent as the original Alexandra Spaulding on "Guiding Light". I did not start watching "Another World" until 1993 when two glamorous actresses, Linda Dano, and Anna Stuart, joined the show as two female characters who were focuses of many story lines for the show's remaining run. As flamboyant Felicia Gallant, Linda Dano was an instant scene stealer; Her on-camera pool fight with a young Faith Ford (Julia Shearer, Liz Matthew's granddaughter) was one memorable sequence, as was her on-screen friendship with Steve Schnetzer (Cass) and the lovable Brent Collins (Wallingford). Collins was the very first little person on a soap with a contract and gave a performance so touching that the memory of his on-screen warmth brings on tears of sentiment. Anna Stuart, as the originally snooty Donna Love, added a complexity to what would have otherwise been a stereotypical snob. By showing her pain from childhood memories, Stuart made Donna one of the most memorable vixen/heroines on the show, as well as daytime. (As of July 15, 2003, both Dano and Stuart are working on ABC soaps and are still the epitome of glamour and beauty). During her heyday on "Another World", Cecile DePoulignac (Susan Keith, Nancy Frangione) was one of the most memorable vixens on daytime; Sadly, the show's later writers turned her into a caricturature of what she had been, ruining many of the great moments she had earlier. The deaths of Hugh Marlowe (the finale Jim Matthews), Douglas Watson, Brent Collins, and Constance Ford saddened even the newest viewers, but such memorable character performers as Kate Wilkinson (as the wise mother of Donna's true love Michael Hudson), Barbara Berjer (as the delightful Scottish woman who raised Donna's daughter Vicky), and Sloane Shelton (as the woman who helped Rachel over her mother's death) helped viewers deal with the loss. Such nasty villains as Carl Hutchins (the delightful Charles Keating), Reginald Love (John Considine), and Grant Harrison (Mark Pinter) were perfectly used to cause problems for all of the major characters, but Victoria Wyndham's over-the-top Justine Harrison (Rachel's evil look-alike) turned some viewers off even with her Grimm Fairy Tale type storyline. Now off the air with original episodes since 1999, "AW" has returned on SoapNet as of July 1 2003, starting with 1987 episodes. Viewers will get to see a few years of Douglas Watson and Brent Collins and a few more of Constance Ford, but there are also many memorable performances coming up. Viewers of "General Hospital" will recognize Denise Alexander and Chris Robinson (Lesley and Rick Webber) reunited as Mary McKinnon and Jason Frame; Soon, "GH's" future Stavkros Cassadine (Robert Kelker-Kelly) will be on as the original Sam Fowler, while "Guiding Light's" Ricki Paul Goldin will be on as Dean Frame. Anna Stuart's Donna will return in a year and a half. By this time, the new Iris (Carmen Duncan) will be on, and Irene Dailey's Liz will have returned from a year and a half hiatus. 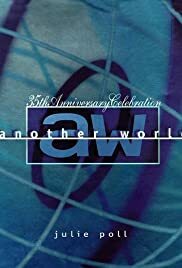 "Another World" via SoapNet is taking old viewers down memory lane, while new viewers will get to see what they missed all along.